Now that we’ve (almost) recovered from all the body pain, it’s time to talk about this year’s Desertfest Antwerp experience. Trix hosted the festival once again and even though it was sold out, you could still easily move around. It’s so easy to oversell a venue for the sake of pure profit so it is a gracious move on the organization to not do that. Kudos! It’s a privilege to be back and see the already familiar faces from past editions and feel a sense of belonging that other festivals just can’t match. Over the previous years, we got used to the festival’s habbit of high-level starts and currently speaking, it still stands as no exception. After a mandatory route pursuing the merch tables, time quickly arrived for this hazed festival start with Kaleidobolt at the Vulture Stage. This psyche prog act gave some cool guitar scales, heavy bass lines, fast tempo shifting and a new song. Desertfest started transporting us to another place in our minds and the crowd quickly felt much alive. With no time to spare, we’re off to the main stage. All Them Witches often suffer some jokes about being a band for girls but a packed and almost blocked entrance to the Desert Stage says otherwise. Their bluesy influences, fast pace and melodic overhaul feel, delights rockers and stoners of all ages and mini-niches. Charles‘s muddy voice complements perfectly the instrumental dissonance giving an upbeat act tough to follow as we gaze one enthusiastic crowd. The newest album, Sleeping through the War seemed to resonate with the fans and worked pretty well on a live context. Some new songs such as "3-5-7" or "Am I Going Up?" were accurately placed between some others from the well-known Lightning at the Door, so they had no trouble in melting the two records together in a well fluid and trippy concert. Desertfest's main stage started with much love in the air and once again sustaining the main room completely packed. There’s a saying that practice makes perfection. After we first saw them resurge early in the year at Desertfest London, it can only be said that Lowrider have been practicing and they are sounding better than ever. They were not so nervous as before and we could often see them smile, definitely happy to be on stage and back to be a band at full time. Important to mention the authentic and genuine energy that makes them drive, transcend and infect the audience and thus giving the concert such a special aura. From that which was a solid performance, we could finally hear a bunch of new songs. They didn't seem strained at all and were a good draft of what will become Lowrider's new album. Fans reacted very enthusiastically but of course, the crowd really went nuts with classics such as "Convoy V", "Caravan" or "Ode to Io". For those who may think that a thematic festival like this one can only be all about the same, this lineup and especially the way the running order was arranged on this first day prove that to be an absolutely wrong idea. While at the Vulture Stage Kaleidobolt were giving a frantic psychedelia, we went for a quick viewing of Caronte’s acid doom act filled with power drilled riffs and eccentric drums at the Canyon Stage. Next on the same stage came the Japanese Minami Deutsch who grabbed the crowd right after All Them Witches, hypnotizing everyone to the deepest colourfull dreams with their lovely Kraut. Opposed to those two acts, the heaviness grown at the Vulture Stage where Grime started to agitate the waters within a suffocating crowd with a very dark doom sludge and harsh vocals. Later back on the Canyon, Heavy Psych Sounds finest Gozu kept the metal tone, melting a heavy and thrashy groove to their stoner. 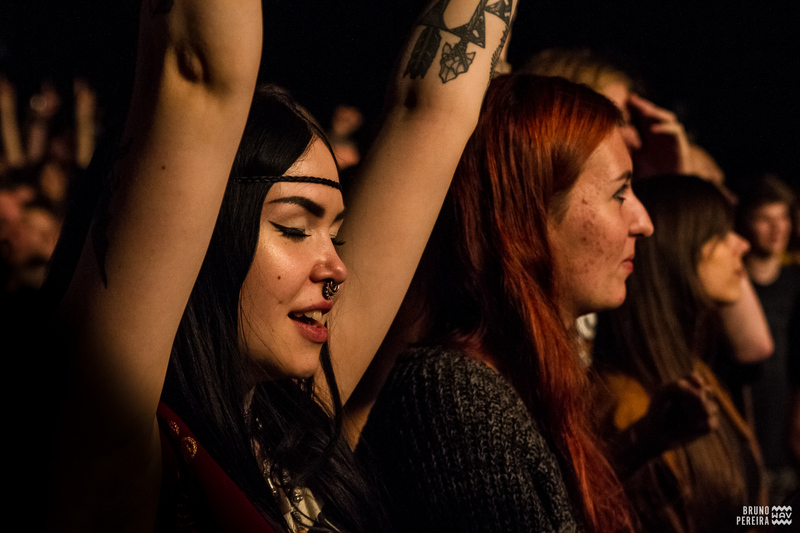 With so distinct acts across each stage, every attendee always had something of their interest going on during the night. Speaking again of practicing, Radio Moscow are clearly studying, implementing some progressiveness in their riffs, which always sounds good and aggressive at the right tempo. The visuals were definitely on point, providing a trip around the cosmos. The journey started with "New Beginning", the opening song of the new album and, after a roll of older hits and new bets, their set closes with "Dreams", the last song also from the new album, ended the concert with a hard psychedelia bang. They undoubtedly fit well at the headline slot and proved that New Beginning is a new high in their career. Meanwhile at the Vulture Stage, sludge veterans 16 kept the alternative heaviness and grabbed the metalheads, transforming the space into a true sweat-bath. Here, another type of hypnosis, made itself be felt whilst hitting the audience with bulldozing guitars of full-blown heaviness. The unmerciful and unrelenting loops of monstrous riffing from the group kept everyone’s head in constant banging cycle. To end the first night some local boys by the name of Steak Number Eight, whose sludge embedded with progressive elements provided a dark undertone and ambience. The many tours provided a perfectly oiled machine. Magnificent drummer, vigorous guitarist and bassist, and Brent Vanneste, who stands out interchanging clean vocals to animal like grunts.